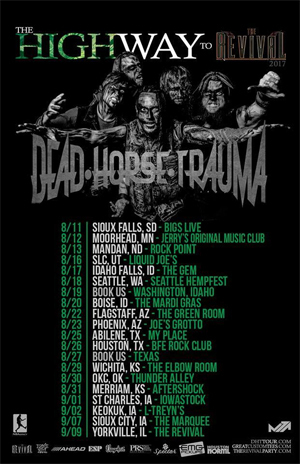 DEAD HORSE TRAUMA announced The Highway To The Revival Tour 2017! The tour will be accompanied by hard-hitting locals from each area and will meet up with various touring bands along the way! VIP CONTEST: DHT will be giving away 2 VIP slots per date to people helping send invites, handing out flyers and putting up posters in their city! Message their Facebook page for details HERE. Since the release of The Unmerciful Infliction EP (2008), DEAD HORSE TRAUMA has separated themselves from the pack with a high energy live show as well as an undeniable work ethic that has taken this band from a home town power house to a national touring juggernaut. With their 6th release Life we see a band that has clearly grown into themselves musically, whether it’s the lyrical message of the song "Left Unsaid" or the delivery of the riffs on "The Family". If this album shows where metal music as a genre is headed then strap yourself in for one hell of a good ride.